My homage to Alexandre Dumas, one of my favorite writers. It is a blatant ripoff of The Three Musketeers. It all started when we were sitting around assigning people we knew to Dragaeran Great Houses, and I mentioned that a the archetypal Lyorn was Athos in Dumas’ work. Then I said, “Aramis is a Yendi, and Porthos is a Dzur, and…hmm. That’s interesting.” I really never expected this one to be published. I wrote it for the sheer joy of writing it—I giggled all the way through. No one was more surprised than me that, not only was it published, but a lot of other people seem to like it. Cool. Great cover, isn’t it? This is the first of your books that I read. i was at a school book fair, and needed to find one more book to complete my order. I strolled around a bit, and saw this cover. I was completely sold immediately, and even though I was only 12 or 13, and didn’t fully understand what i was reading, I began gobbling up everything I could find with your name on it. You have been my favorite author ever since. Thank you for sharing what you find cool with the rest of us in book form. While I’ve yet to be disappointed in any of your books (& I’ve read them all multiple times), this one remains my favorite. When first reading it, I was immediately put in mind of the 2 excellent mid-1970s Musketeer films directed by Richard Lester & starring Oliver Reed & Faye Dunaway along with a thoroughly brilliant cast. If you’ve not seen them, you should certainly do so. 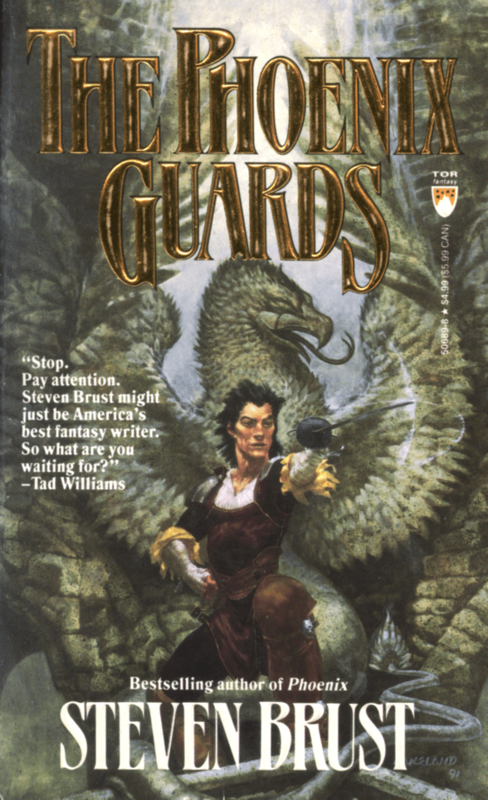 You’ll see why I found The Phoenix Guards so evocative. Thank you for being the one certainty in an otherwise uncertain world. I can always count on being completely entertained with superior storytelling when picking up one of your books. Even when it’s a re-read. I look forward to Hawk with bated breath. Totally agree with Ty. The Phoenix Guards was the first of your books that I read. Found it at a 6th grade book fair, and while the language and style of speech made it initially difficult for me to read, it none the less became one of my favorite books. It left me hungry for more,which eventually led me to Vlad. The rest is history. I still claim these works are my favorite series of fantasy literature. I’m about to loan this to a friend, because memory of “Paarfi of Roundwood is the creation of a writer who, at first, wished that the style of the French Romantics (Dumas, Sabatini, etc.) was still popular, then decided he didn’t care, and he’d blood well write like that, anyway”… recently inspired me. Recently: I’ve owned “The Phoenix Guards” since pretty much the time that it came out, and devoured it as soon as I’d bought it, as I did with the rest of The Khaavren Romances. I was already a fan of the Vlad Taltos books, and this was familiar, while appealing in a whole different way. So… it’s been quite a while between reading that sentence with gleeful appreciation, and getting inspired by memory of it, a few weeks ago. Inspired to “…bloody well write like that, anyway.” I am far from immune to the appeal of the style of the French Romantic originals, myself, and I think that the Paarfi take may, if anything, be even better. By loaning the book to this friend, I hope to inspire writing between (at least) the two of us, in just this vein. Not Fan-Fic. While I can think of far worse fates than hooking my friend on your work, I’m picturing us writing original stuff, purely for our own amusement, with no thought of publishing. You know, like you were thinking when writing :The Phoenix Guards” in the first place. 😉 I honestly don’t intend this for publication, or putting it out there on the web, though I’m willing to be surprised. Of course, setting the book aside to be loaned next time I see her, prompted me to re-read the first few chapters, in an odd moment. I’m about half-way through the book, now, and by the time I see her tomorrow night, I will certainly be done re-reading it. Yet again. 🙂 Because I laugh roaringly and thrill fiercely and inwardly cheer and bite my lip and grow agreeably melancholy and enjoy just as much now, as every other time. It’s the same with all the Romances, except that with “Sethra Lavode”, there’s also outright weeping by the end. Which is why I can’t read it as much, for all I love it. [And don’t even let me get started on the complex web of emotions I get from what I’ve read so far of Vlad’s saga!] So yes, a big part of this message is a “thank you”, on more than one level. Of course – and this, too, is a very important part of this message – there is something I need your help with. It’s not about writing French Romantic style. It’s one part of this book that I go thoroughly crazy over. As in, I have enough actual Obsessive-Compulsive Disorder to prevent me from letting this go, until the point at which I forcibly throw it from my thoughts by sheer willpower. In two words, it is this: the references, attached to the conspiracy our heroes find themselves arrayed against, to the candlebud flower of Khaarvren’s (and Tazendra’s?) native Sorranah… to my mind, are never made explicit enough, nor even present enough information the reader can reason from, to allow what the candlebud means, represents, signifies, implies, or what use it has, to the conspiracy, to become clear. Nor is the flower ever mentioned – in this context – in **any** of your books that I have read (I believe I have read the Vlad Series up to not only “Issola”, but “Dzur”). It is simply never explained. And the references in “The Phoenix Guards” are **so** provocative, that never learning what they are intended to mean, is truly maddening! To the likes of me, anyway. So please, sir, help out a devoted fan driven to distraction. Whether I’ve managed to miss the explanation, or it’s known only to you, please spell the answer out for me. Thanks for all the kind words. As for the candlebud, well, anyone want to take a crack at it? But suffice to say, the Consort likes Candlebud. Nylissa or whatver their names are…might they be the Emperor and his Consort? Or maybe Allistar and the Consort? And might the mention appear to them as a gentle hint by the Phoenix Guards that they are well aware of the identities of those who accompany them? Don’t know what to think about Twicetied Hills though. Any guesses? I haven’t not gotten around to the Khaavren Romances yet, though they are on my agenda like a lot of other tomes. My wild guess would be a nod to Napoleon and violets. “Speaking of eyes,” said Tazendra. I do like that conversation above, where they all (Khaavren in his contribution just before the excerpt quoted) contribute to the deduction that their traveling companions are not what they pretend to be. Though it does phase me that, whenever the subject of that trip comes up later in the book, in spite of her having spoken of eyes at the time, Tazendra is continually astonished that such a deception could have taken place, right under nose, without her having a clue about it. I am only puzzled, Mr. Halter, in how you mean it to explain the conspiracies use of references to Candlebud. I prefer the speculation. It’s possible I might someday produce an answer, but don’t bet the farm on it. Re-reading now for the second or third time and it’s just as good as the first. Parfi is one of the great unreliable narrators of fantasy fiction right up there with Corwin of Amber and Bilbo Baggins. I sincerely hope to read more from him soon. Thank you kindly. There will be more in just about a year. I should explain that it is Paarfi, but not Khaavren (although his wife makes a brief appearance). Please tell me its basically your version of the Count of Monte Cristo and that it will be ridiculously long. Uh. Well. Basically, yes and yes.